Vsyevolod III Yur'evich Bolshoe Gnesdo was born in 1154 as a son of Yuri Vladimirovich Dolgoruki, prince of Suzdal and Yuri's second wife whose name is not known. Vsyevolod married Maria, daughter of Shvarn, prince of Ossetia; and then around 1209 to Lubov'na, daughter of Vasil'ko Bryachslavich, appanage prince of Vitebsk. His sons were Konstantin, grand prince of Vladimir; Boris, crown prince of Vladimir, who died at age one in 1188; Yuri, grand prince of Vladimir; Gleb, crown prince of Vladimir who died in 1188 at less than a year old; Yaroslav II, grand prince of Vladimir; Vladimir appanage prince of Yur'yev and Starodub; Svyatoslav II, appanage prince of Yur'yev and grand prince of Vladimir for a short time; Ivan, appanage prince of Starodub; and his daughters were Verkhuslava, Vsyeslava (who married Rostislav Yaroslavich prince of Chernigiv) and Vasilisa. 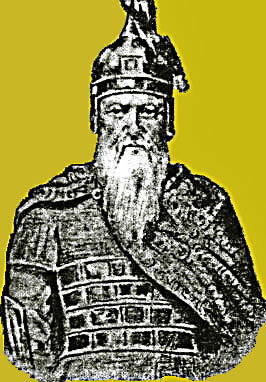 Vsyevolod was prince of Pereyaslavl Zaleski (1175-76) then great prince of Vladimir (1176-1212). The family is shown on this chart. His first important work was the rebuilding of the Dormition in Vladimir after the disastrous fire of 1183, dedicated in 1194. Vsyevolod's second church, and one built wholly by him, is the Church of Saint Dmitry, which stood in the now vanished courtyard of the palace. It was begun either in 1193, soon after a fire had ravaged the palace, or in 1194, in honor of his patron saint and of his son Dmitry born that year. It was apparently finished in 1197, when Vsyevolod installed in the church relics of Saint Dmitry brought from Salonika. 1202 - he sends his son, Vladimir, to rule Periaslavl- and interfers with the dynastic struggle in Kyiv.